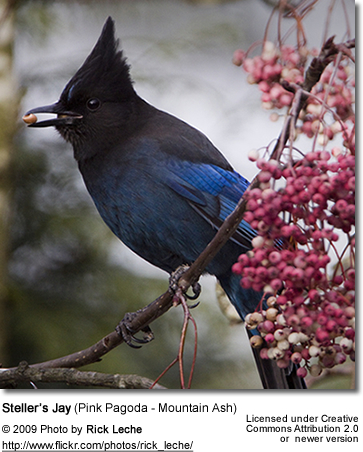 The Steller's Jays (Cyanocitta stelleri) are large songbirds that are native to western North America. Their range stretches from Alaska south through the United States into Mexico. Several subspecies are found in Central America. 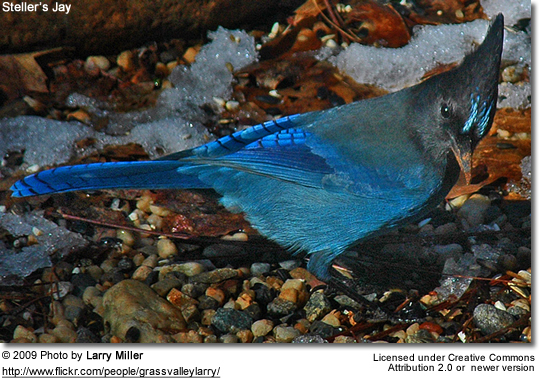 They resemble their close relatives, the relatively common Blue Jays, found in the rest of the continent. 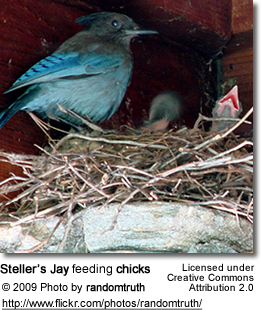 However, the Steller's Jays can easily be separated from their cousins by the black head and upper body. 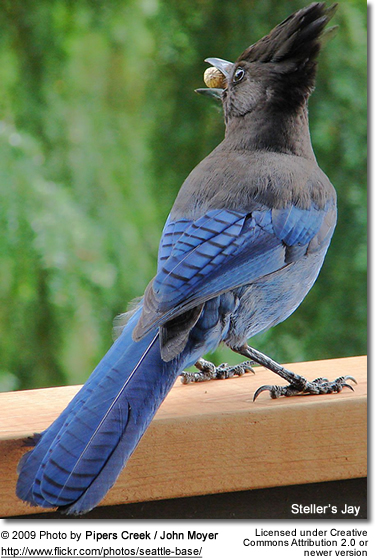 The Steller's Jay is the only crested jay west of the Rocky Mountains; and the Steller's and the Blue Jays are the only uncrested jays found in North America. Depending on the subspecies, the crest can be either blue or black colored. 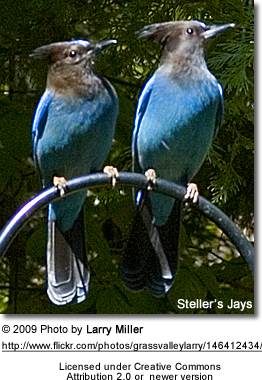 The Steller's and the Blue Jays are known to interbreed in areas where their ranges overlap. 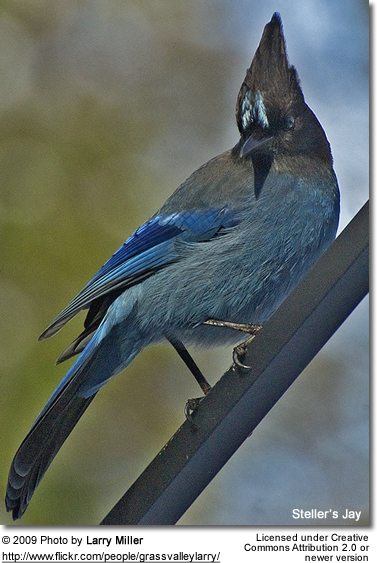 Long-crested Jays, Mountain Jays, Black-crested Jays, Coast Jays, Connective Jays, Osgood's Jays, Queen Charlotte Jays, Sierra Nevada Jays, Blue-fronted Jays and Pine Jays. These jays are excellent mimics and are able to imitate the sounds and calls made by other birds, cats, dogs, squirrels and environmental noises from their environment. These jays are known to be quite aggressive with smaller birds, such as Juncos and Nuthatches, and have been observed attacking and even killing them. They will also steal and feed on the eggs and chicks of other birds. 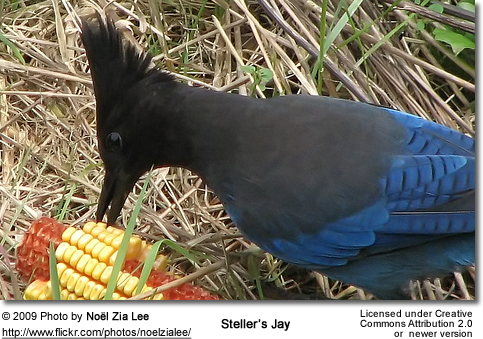 The Steller's Jay was originally named after the naturalist who discovered this species in 1741, Georg Steller. 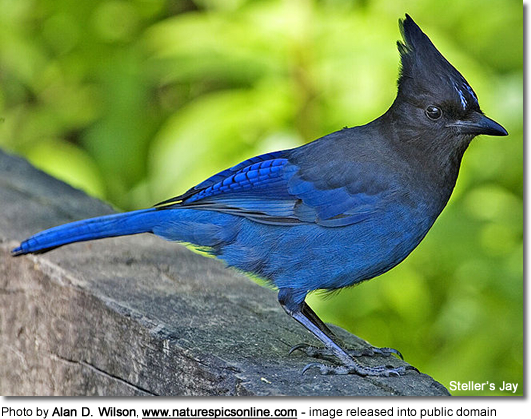 Steller's Jays have a natural range that extends from southern coastal Alaska south through the Rocky Mountain region of Canada and USA south into Mexico ending in north-central Nicaragua in Central America. These social birds are usually seen in flocks or pairs. It is the provincial bird of British Columbia. ID: Some have white streaks along the forehead and supercilium ("eye brow"). 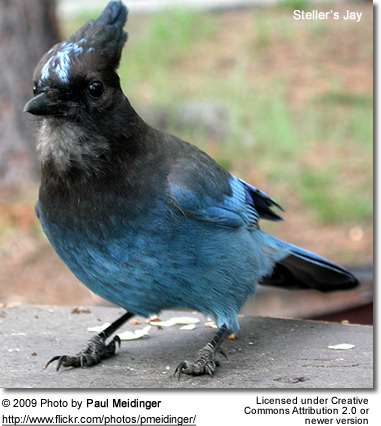 Generally a dark-plumage jay with a charcoal black head and a blue body, somewhat lighter on the wings. Black barring on the wings. Primary diet consists of nuts, a variety of seeds (such as pine seeds), acorns, nuts, berries and other fruits. They are also known to feed on the eggs and chicks of other birds; and will hunt small invertebrates in their environment. They also visit bird feeders and picnic areas in parks and camp sites. Nests are typically located in conifers or may be found in the cavities of trees, and are often found on horizontal branches close to the trunk and often near the top of the tree. The cup nest is constructed by both parents out of stems, leaves, moss and sticks, and held together with mud. It is lined with soft rootlets, pine needs, animal hair and down. 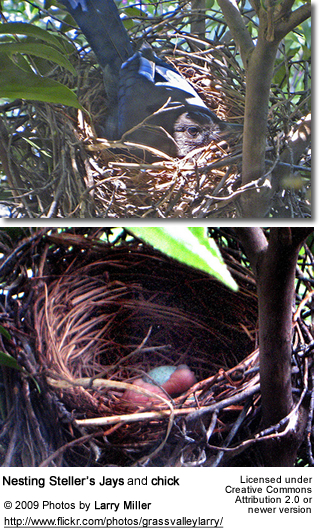 A clutch consists of 2 - 6 greenish-blue, brown or olive-speckled eggs that are incubated by the female for 16 - 18 days. Both parents raise the young, which take their first flight when they are about three weeks old. Calls include harsh nasal "wah", "shack" or "shooka" sounds. 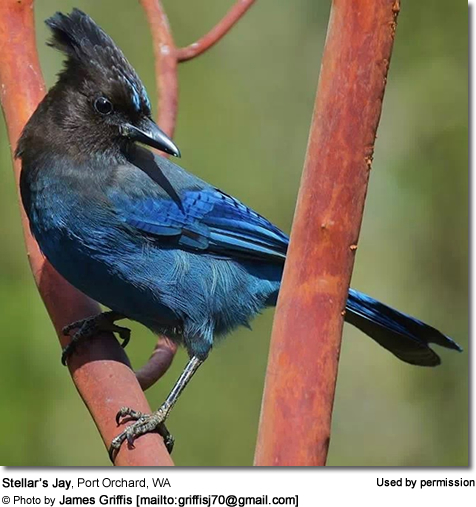 The oldest recorded Steller’s Jay lived 16 years and 1 month.